Terri is daughter to the late Ghanim Ankawi and survived by her mother Nasra Ankawi (Marogi); brothers and sisters include beloved Raghid, Nash (Eman), Van (Cindas), Wendy, Jack (Lilyan), and Rudy (Farrah). Please join the family in prayers of comfort at Shenandoah Country Club in West Bloomfield on Monday, October 8 from 4-8 PM. May the Lord Grant her eternal rest. Amen. 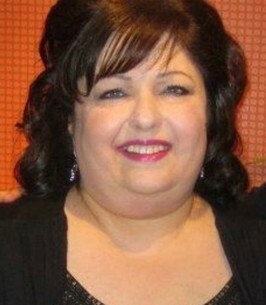 To send flowers to the family of Terri (Taghrid) Ankawi, please visit our Heartfelt Sympathies Store. Terri is daughter to the late Ghanim Ankawi and survived by her mother Nasra Ankawi (Marogi); brothers and sisters include beloved Raghid, Nash (Eman), Van (Cindas), Wendy, Jack (Lilyan), and Rudy (Farrah). Please join the family in prayers of comfort at Shenandoah Country Club in West Bloomfield on Monday, October 8 from 4-8 PM. May the Lord grant her eternal rest. Amen.